I'm not a foodie. But I love eating. And I need to eat regularly. Or I get cranky. 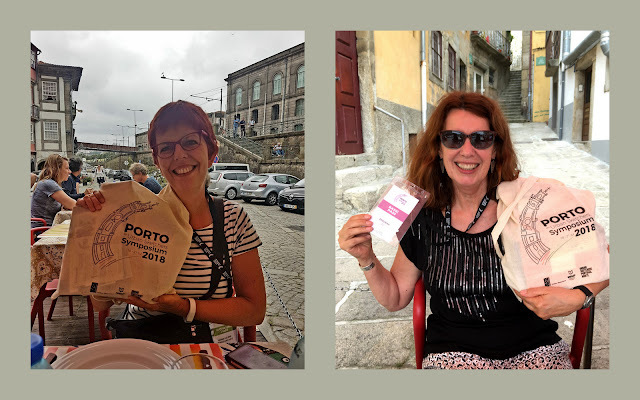 So I made sure I took every opportunity to eat while in Porto. It's not hard. There are restaurants everywhere. For breakfast, I got a few things in the nearby mini-market - so I had green tea, yogurt, blueberries, banana, rice cakes and a square of dark chocolate. A good way to start the day. Lunches were mostly rushed during the symposium, as we were going from workshop to workshop/sketchwalk. Dinners, we had a bit more time. We ate well every day, despite minimum Tripadvisor research in advance!! DaTerra vegetarian and vegan restaurant, on the ground floor of my building. Noisy, and staff can be a bit stressed at times, but the food was simple and tasty. And it's an all-you-can-eat buffet at lunch and dinner during the week. Tram Restaurante, just beside the tram, lovely terrace shaded by a big tree, nice service. Delicious food. Sardines bruschetta starter! And then I had a main course of octopus and potatoes and salad. A good lunch! Despite my love of octopus, I was able to eat this! It was perfectly cooked. Firm but tender. I wasn't sure of the name of this place. 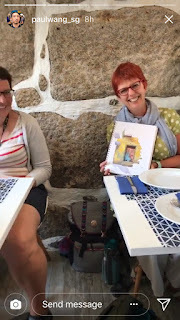 It's a little restaurant on the little praça just below the Alfândega do Porto, our hub for the Urban Sketchers Symposium. According to Google Maps it's called Casa Mara. The owners were a bit stressed as every chair was taken by hungry sketchers. But the food was lovely, and very good value. We wanted to eat there one evening, but they were closing. Maybe they were sold out. And they feed the local felines, including a beautiful Siamese cat. In this picture, sardines and rice. This wasn't the best meal of the holiday, but it did the job - chicken, rice and crisps. I was hungry. It filled my tummy. Somewhere near Rua das Flores. A pork restaurant. Friendly and good value. The power kept going off. Back to DaTerra for a lunch on my own. I needed a break from all the talking. I actually found the food better at lunch. And I had an Eddy Veggie green drink that pepped me up. Taberna do barqueiro - this became my favourite restaurant in Porto. We wanted dinner in Casa Mara but they were not serving food in the evening, so we went literally across the lane. This turned out to be delicious. I had octopus and rice that evening. Pat had the seafood pasta, which looked divine. With a glass of vinho verde, the perfect end to the day. And good value too. Back to Taberna do Barqueiro - octopus and salad. I had sardines and salad another lunchtime and it was equally delicious. And on the last day of the symposium the chef brought pastries to Shari Blaukopf and her students, who had been sketching in the lane right behind the taberna. Not my best picture, but this is Taberna do Barqueiro - the yellow building with the red window frames. Small, but perfect. For our last night, we found a more upmarket restaurant, Restaurante LSD (don't ask, I have no idea). On the little praça at the bottom of rua das Flores. There was no room at the terrace, so we ate indoors. Some had fish, others had meat. I went for a vegetarian dish - peas, barley, asparagus and other bits and pieces. It was delicious, and still amazing value. I couldn't end this post without mentioning pasteis de nata (pastel de nata is the singular, pasteis de nata is the plural). A sweet pastry with custard. Delicious at any time of the day or night! And I was able to buy a box of six at the airport to bring home to my husband! I attended 4 workshops at the Urban Sketchers Symposium in Porto - I still remember that nerve-wracking day in January/February, when over a thousand people around the world were ready at their computers, waiting for the clock to tick over for the time when they could pounce and register for their workshops. I was lucky. My internet didn't drop half-way through. I got my top 4 choices - I had been ready for alternate choices in case they were sold out, but thankfully didn't need to. So I got Liz Steel, Shari Blaukopf, Suhita Shirodkar and Marc Taro Holmes. Wow! What a line-up! There was another 10 workshops at least I would have loved. But I felt so privileged, so lucky! As it turned out, Marc Taro Holmes wasn't able to attend the symposium, for family reasons. An artist from Malaysia, CJ Khoo, was going to replace him. And that was fine with me. I loved every single workshop - Liz Steel for her sheer energy and the joy to watch her in action, Shari Blaukopf for her clear teaching, simple method and warm encouragements, Suhita Shirodkar for teaching something so terribly difficult and pushing us to work fearlessly like she does, and CJ Khoo for painting a fully-finished piece, right in front of our eyes, and making it seem easy, like something we might be able to do ourselve, some day (well, I'm not there yet!). Hard at work. We were exhausted after the walk uphill to get to our location. But Liz bought us cakes, so all was forgiven!! That's me with the red hair! Shari Blaukopf chose a spot close to the hub and we set to work very quickly. Every location is a good location in Porto! Yes, it was busy and noisy - but that was the point of the workshop - how to work in busy locations to capture the action, focusing on people. Definitely something I want to do more of! My painting didn't look as good as some of these, but I was inspired all the same. And I had a nice chat with Marco, who is from the UK but now lives in Porto and works for an architecture firm. We knew we had been interviewed. But we thought we hadn't made the cut, as BB saw an interview with a Portuguese girl (the one who designed the logo - and what a cool logo it is!) and couldn't find anything with us. And then the following day, Liz Steel saw me at the hub and said "I saw you on TV!!!". So BB had to spend more hours sifting through Portuguese Television news to find "our" clip. Deb and Me - not quite A-list, but celebrity sketchers all the same!! 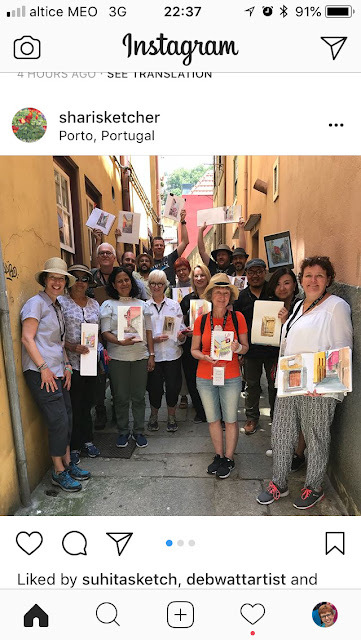 It may be very strange to them, as they are normal people like you and me, but Urban Sketcher instructors are the rock stars of our world-wide community! And it must be weird when someone like me asks how was your flight out of the blue when you've never met me - but that's what happens when you put your life online - it brings people closer. Which is wonderful, but also somewhat one-sided, in that you know nothing of me, and I seem to know a lot about you. Anyways, apologies to Paul Heaston if he thought it was odd to have me barging in to say Hi when you were peacefully walking down the street with your friend Lapin! It was the first day. I was excited to meet my heroes in the flesh! And imagine the extra level of excitement when I turned around and Veronica Lawlor was there, right beside me - well I think I managed that interaction a little better, as I'd done Veronica's class "A drawing a day" on Sketchbook Skool not long ago, and I actually had something to talk about! My husband was concerned I would get too enthusiastic, and that all people would think when meeting me would be 'Kathy Bates in Misery'! First of all, let's establish that I have no violent tendencies, and I don't live all alone, and I am quite sane. Yes, I get over-enthusiastic about things I love, and I do sometimes make inappropriate comments. Asperger's runs in the family after all - but I consider myself only mildly on the spectrum. So by the time I got to meet Liz Steel on day 1 of the Symposium, I was quite normal! And once Deb said that I was with her, my credentials were established and we were able to have a really nice conversation! I did get a selfie with Liz, and Pat was good enough to take a few pictures while we were talking! Wow, Day 1, and I'd already met my hero! Another day, Gabi Campanario, founder of Urban Sketchers, walked past us and Pat and Deb chatted to him. Pat took this lovely photo. Gabi took a selfie with us too, but I haven't found it on his social media pages yet. 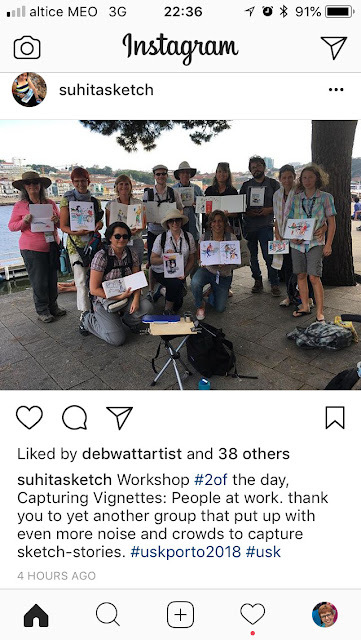 OK, this one is not a celebrity shot per se, but Paul Wang actually took a picture of my sketch (from Shari Blaukopf's workshop), so I was really chuffed. And this one is Uma Kelkar and me, holding her painting, which I successfully bid for in the silent auction at the end of the symposium. I had loved that painting the moment I saw it, which was a few weeks ago in the #30x30directwatercolor2018 Facebook group. I didn't realise then quite how large it was, so I was smitten the moment I saw it at the auction. The first person had bid €10 only, which was ridiculous. So I increased the bid. I had to go back in 3 times I think to secure it. In the end, it got personal - but I didn't go beyond the number I had at the back of my mind, and I still think I got a great bargain. And I managed to bring it home safely - great quality watercolour paper and good packing advice from a number of people! Met and talked to so many people in Porto that I started losing my voice by day 3 (paying for it now with a laryngitis). It was funny how I kept bumping into the same people, out of over 800 sketchers in the city. Annie from Normandy, Ludmilla from Ukraine, Jane, Judith, Chantal,... Talked to sketchers from Belgium, Australia, Canada, Switzerland (via Ōsaka and Singapore), Germany, the UK, France, the US, India (via Waterford), Bushmills (via the Languedoc), and so many other places. We ended up forming a little core group - in the evenings, Deb, John, Pat and myself met up for dinner most days. For lunch, we always made sure that the other two were not alone, no matter how little time there was between workshops. And Deb and myself became good friends - I think we knew the moment we met each other that we were on the same plane (not a flying plane, a mental plane - what's the word I'm looking for?). We sketched together, we made a TV appearance together (more about that later), we giggled a lot. We had a blast. A certain sketcher even commented that we made a lovely pair!! (Mmm...) Can't wait till next year in Amsterdam to see her again! 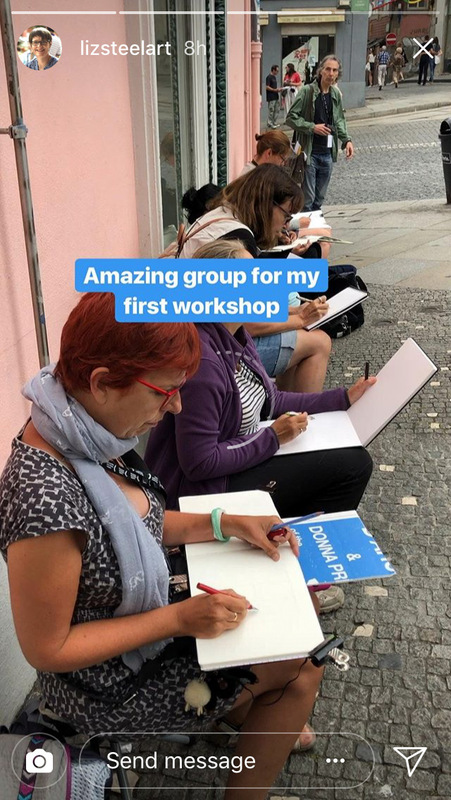 The first day in Porto was my most productive too - I just threw myself into sketching, and we went from one location to the next, chatting to other urban sketchers and working at the same time. We (well, I did most of the chatting actually) talked to people from all over the world - it was such an exhilarating experience - all these people who had travelled to one location, for one purpose only, urban sketching. Mind blowing. I even recognised an artist by her style of drawing - I didn't know what she looked like, but I knew her work (Pat Southern Pearce is her name, in case you're wondering). You can't draw Porto and ignore all these terracotta roofs. And what surprised me is how green it is. I painted this sketch in direct watercolour - no pencil, no pen - just threw myself into it. It was morning, and already hot. The sun was lighting the other side of the Douro, so there is very little shadow. After a gorgeous lunch, we sat on a bench in the shade and sketched these two musicians. Porto, like most tourist destinations I guess, is full of street performers. If I was to do this sketch again, I would add more shadows. Well, I've learned a lot in a few days! Praça da Ribeira - busiest square in town. Fantastic views everywhere. Colourful houses. Dom Luis bridge (it wasn't the focus of my sketch). Umbrellas. Crowds. sketchers everywhere. And a pesky pigeon who tried to steal peanuts from the little jar on the table. Lots of seagulls too, everywhere around town - in the morning, I'd hear them descending on the streets, like a swarm of zombies, looking for food. Well, I was bound to get tired at some stage. Plus the chair was really uncomfortable, on a slope. But this café was really cheap, so no complaints from me. 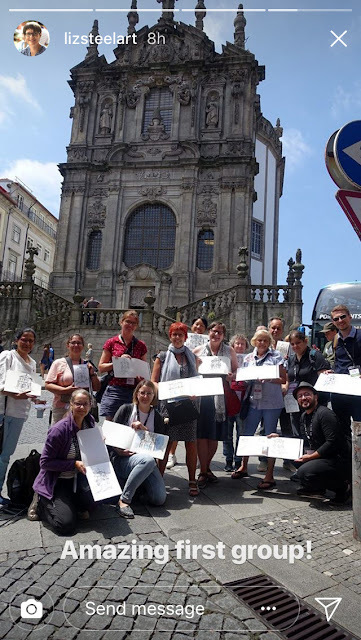 I went inside that church (at the bottom of Rua das Flores) in the morning a few days later - wow! - big chandeliers, tiling, sculptures - and so peaceful. The little boy street performer (and his parrot) was in there, praying before the start of his day's work. He looked like a character from a Dickensian story. The father had one of these weird hens. I saw the little boy reading a comic book the following day. The view from my window (3rd floor). And now I understand why urban sketchers who live in these sunny places use black ink for shadow and white for surfaces in the sun (this building is actually a lovely shade of pistachio green). One Spanish artist was actually getting frustrated when the sun went in. Giggle by students from Ireland and Luxembourg, where we have to "imagine" the shadows! 15 minutes walk from the hub. Lots of shops and restaurants nearby. And you can get back to the block without having to face the really steep roads. Cosy bed. Streets are noisy, but good windows and shutters keep the noise at bay. It got a bit hot though, so I had to use the fan, which I blame for my sore throat and coughing. No air conditioning. Which is ok if you have time to get back to your apartment before dinner and you open the windows. But my schedule was pretty hectic so I only managed to do that once. Very nice kitchen. I used the fridge and the kettle only, but it had everything you might want. And there is a little supermarket nearby. It's going to take me a while, so be patient. I'm just back from Porto where I spent 5 days at the Urban Sketchers Symposium. It was a blast! How do I capture all the memories? So, let's start at the beginning. Dublin Airport. Ryanair flight (PS - was so lucky that my travel dates didn't coincide with the strikes). With my fellow Dublin Sketcher, Pat. A great location for Dublin Sketchers - Temple Bar Gallery + Studios. We were invited by the TBG+S to take part in their weekend of art for everyone. They gave us access to the best kept secret in Dublin - their 3rd-floor terrace with wonderful views over Bloom's Hotel, the Central Bank and even Ha'penny Bridge. And a deliciously-cool breeze on a hot summer's afternoon. I started my sketch with paint only - shapes and proportions started to run away on me, so I picked up my pen to rein it all in! And then I quickly sketched a sketcher, and I feel it gave the overall view a sense of being on a balcony. And since I tend to work relatively fast, I then went downstairs and sat against a wall and picked up one of my fountain pens to draw the people who were busy painting downstairs. I added a bit of water for shades of grey. By then, I was ready to sit down and chat with everyone. A very happy afternoon! Even though I've painted with watercolours for a good few years now, I still forget some of the basic skills that make it such an interesting medium. So it was good to practise with this very useful video from Anne-Laure Jacquart, a.k.a. the White Rabbit! And with this one, I copied another video from the White Rabbit, after my own disastrous attempts at painting ferns a few weeks ago. I'm learning a lot from Anne-Laure! Hopefully I'll remember some of it when I'm in Porto! And hopefully I'll bump into her there! From two drawings done by another artist. I don't really see myself in these, maybe because my face rarely looks that serious. But it was a very useful exercise. I like my nose on the left-hand side! I must do another one with my new hair colour - that will be a lot less tame - my Diables Rouges look!! After drawing, painting, from a drawing or from life. I like it more from life - you can't beat the energy of a life model! It was tough to find the patience to get the drawing right first before jumping in with watercolours, I have to admit. Done from two drawings. A bit stilted. Also from life. This one needs a little more work to lighten some of my darks, particularly between the model's arms and her chest. I had done my homework on mixing skin tones, and I had a blank sheet of watercolour paper beside me to test the colour before applying paint to paper. All good lessons learned. A quick portrait of one of the other students. Her skin is actually quite pale, but it was a hot day and we were all sweltering!